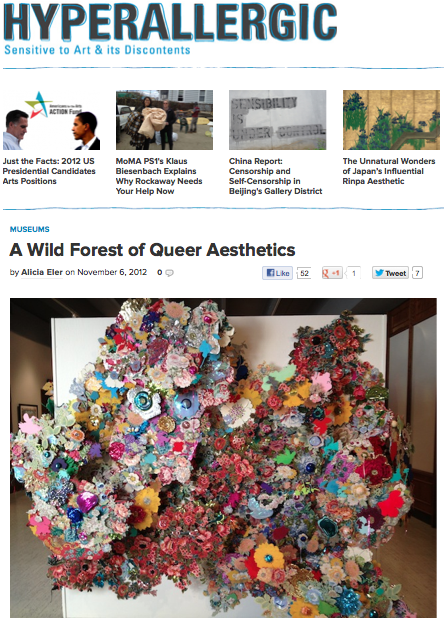 All Good Things Become Wild & Free was reviewed on Hyperallergic by local arts writer, and dedicated supporter of queer arts, Alicia Eler! Update! Eler has also written a follow-up to her article on the queer art shows that have opened since the summer here in Chicagoland – 3 in total! It’s less of a review and more of a opinion/thought piece on the developments in aesthetics termed or argued to be ‘queer’ recently exhibited around town. Check it out! Check the whole thing out, here! And read her review of The Great Refusal: Taking on New Queer Aesthetics, the exhibition at the Sullivan Gallery for which we BOTH wrote something for the forthcoming catalog! Small world!